The greenhouse gasses keep the Earth 30°C warmer than it would otherwise be without them in the atmosphere, so instead of the average surface temperature being -15°C, it is 15°C. Carbon dioxide contributes 10% of the effect so that is 3°C. 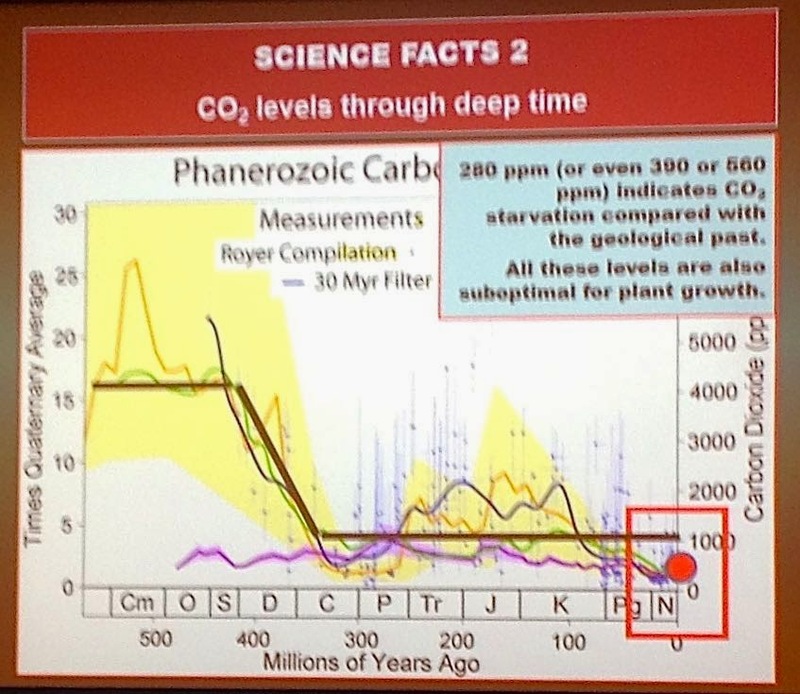 The pre-industrial level of carbon dioxide in the atmosphere was 280 ppm. 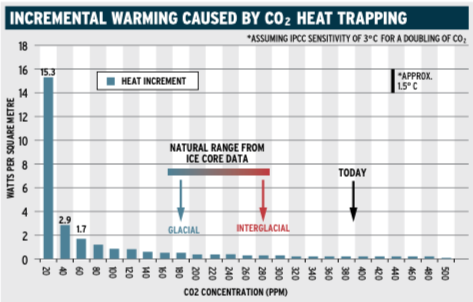 So roughly, if the heating effect was a linear relationship, each 100 ppm contributes 1°C. With the atmospheric concentration rising by 2 ppm annually, it would go up by 100 ppm every 50 years and we would all fry as per the IPCC predictions. But the relationship isn’t linear, it is logarithmic. Is less warming bang really generated by every extra carbon dioxide buck? Yes, carbon dioxide is of limited potency and waning influence as its concentration increases. next 20 ppm causes warming of 1.7 W/m2. This pattern continues as one moves across the figure to the right, such that even at the relatively impoverished carbon dioxide level of 180 ppm that marked recent glacial episodes, more so at the 280 ppm level that marked the pre-industrial atmosphere and even more so at today’s 390 ppm, further 20 ppm increases in carbon dioxide produce only a tiny (0.2 W/m2, and successively lessening) amount of extra radiation forcing. Given where Earth’s atmosphere sits on the scale today (at 390 ppm), it is apparent that further increases in carbon dioxide will produce only very small increases in radiation forcing and thus global warming. Regarding the much- feared doubling of the pre-industrial level (i.e. an increase from 280 to 560 ppm), and noting the decreasing radiation forcing inherent in the logarithmic relationship (Fig. 16, p.103), at 390 ppm the Earth has already realised nearly 50% of the additional radiation forcing and anthropogenic warming that will be induced by a full doubling of carbon dioxide from pre-industrial levels. Given the importance of the less-bang-for-every-additional-buck nature of the relationship between increasing carbon dioxide and extra warming through radiation forcing, it is extraordinary that an explanation of the matter is almost entirely absent from the public debate. 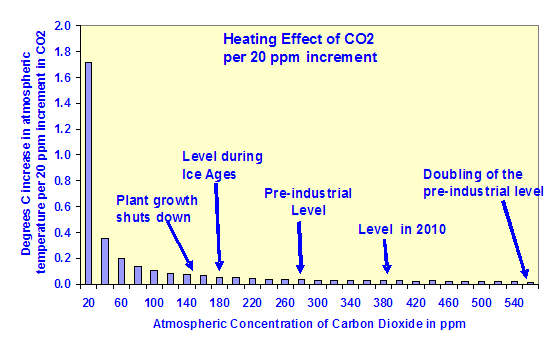 Even if all of the up to 0.8ºC warming that occurred in the 20th century were to be attributed to carbon dioxide (an unsubstantiated and highly contentious proposition in itself), the relationship implies that a full doubling of carbon dioxide over pre-industrial concentrations will produce under 1ºC of future additional warming. Further, if the concentration were to double again to 1120 ppm, the additional global temperature increase would be less than another 2ºC. So, although organisations like 350.org want to reduce the amount of CO2 in the atmosphere from its current level of 400 parts per million to below 350 ppm, their aim is actually anti-science. The current level of carbon dioxide is re-greening the planet. More CO2 will cause dangerous warming - WRONG. Absolutely, the effect of CO2 (taken by itself) is logarithmic. In the real world, its effect is even less. Here is why. Suppose that the Earth's atmosphere had another greenhouse gas (we'll call it X2O) with exactly the same radiative properties as CO2 -- same absorption bands, optically the same. In that case, we would have to calculate the effects of increasing CO2 not just based on how much CO2 we added, but on the total of CO2 plus X2O. If the atmosphere already had, for example, 100 times more X2O than CO2, then doubling the amount of CO2 would only increase the greenhouse effect by a miniscule, almost immeasurable amount. Is there another gas exactly like CO2? No -- but there are other gases that are similar to CO2. Their bands do not overlap CO2 completely, but they still overlap to a large percentage -- and to the extent that they overlap CO2, they have already saturated the absorption of long wave infrared. Water, of course, is the major greenhouse gas, and it is present at a concentration many, many, times that of CO2, and its bands do, indeed, overlap those of CO2. Any effects that increasing CO2 might potentially have had, are already being covered by all the water vapor in the atmosphere. CO2 increases have made, and will make, essentially NO difference in the planet's temperature. The argument is that the future CO2 emissions will increase at an exponential rate, causing linear temperature increases. Based on past CO2 growth, the curve you would use to extrapolate does appear to be exponential. This is the curve that is used for calculating potential human CO2 emissions that are used in the different predictive climate models.